Sumo is Japan's national sport and has existed since ancient times. Professional sumo started in the Edo Period (17th century). In the middle of January , the year’s first sumo wrestling tournament is held at Ryogoku National Sport Indoor Arena in Tokyo for 15 days. 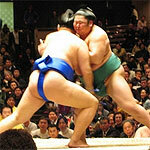 In sumo, two wrestlers face off in the middle of the dohyo ring measuring 4.55 meters in diameter. Every action, such as scattering of purifying salt on the ring, is part of sumo’s ancient tradition. There are 70 different ways to win, such as oshidashi (push out), uwatenage (over-arm throw), yoritaoshi(frontal crush-out), or yorikiri (frontal force-out). champion), Ozeki (champion), and Sekiwake (junior champion) are the top three ranks. They wrestle with several ranked competitors during the 15-day tournament, and a winner is decided. Sumo wrestling tournaments have been held six times a year since 1958. The achievements of a few foreign wrestlers have gradually internationalized the appeal of sumo. The number of sumo fans is increasing not only among Japanese, but also non-Japanese. Japan is a volcanic land with more than 2,000 onsen (hot spring) resorts all over the country. It would be unusual for any other nation to have as many onsen as Japan has or to love onsen as much as the Japanese do. There are onsen with various qualities of water, and they have been used since ancient times to treat wounds and illnesses. Japanese inns and hotels can be found at famous onsen spots, forming large resort areas. However, with the increasing demand for outdoor experiences in tranquil areas, isolated onsen deep in the mountains have become popular, and there are more and more people who enjoy contact with nature in open-air baths. Kamuiwakka onsen in Hokkaido and Yahiko-Iwamuro onsen in Niigata Prefecture for rheumatism and neuralgia. Dake onsen in Fukushima Prefecture for gastrointestinal disorders and fatigue. Shimobe onsen in Yamanashi Prefecture for bruises and bone fractures. Otari onsen in Nagano Prefecture for wounds and neuralgia. Shirahone onsen in Nagano Prefecture for female disorders and rheumatism. Hakusan onsen in Ishikawa Prefecture for female disorders, gastrointestinal disorders and respiratory disorders. Yuki-Yunohama onsen Hiroshima Prefecture for stiff shoulders and lower back pain. Ibusuki onsen in Kagoshima Prefecture for obesity and rheumatism. Hinamatsuri is on March 3 and is the festival to pray for young girls' growth and happiness. Most homes with girls display Hinaningyo (dolls for the Doll Festival) and dedicate to them peach blossoms, rice cake cubes, special coloured and diamond-shaped rice cakes, white sake and some other items. 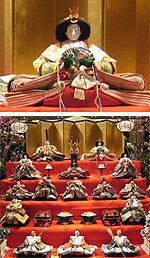 The origin of Hinamatsuri traces back to an ancient Chinese practice in which a person’s sins and misfortunes are transferred to a doll and washed away by setting the doll in a river to drift away. When this practice spread to Japan, it was linked to girls' playing with dolls and was developed into Hinamatsuri in the Edo Period (1603 to 1867). Hina are small dolls for girls and have existed since the Heian Period (794 to 1185). They took their present forms in the Edo Period. A "doll Emperor and doll Empress in ancient costumes" are placed on the highest tier of a five- or seven-tiered stand covered with a red carpet. Under the Emperor and Empress are the “Minister of the Right, Minister of the Left”, the "three court ladies" and the "five court musicians" among others. 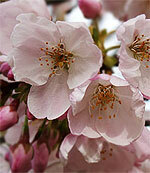 The flower that is most beloved by the Japanese people and that symbolizes Japan is the cherry blossom. From the cherry blossom which blooms and falls only within a week or so, the Japanese sense beauty, as well as transience, melancholy, and perhaps graceful resignation. The lyricism of the Japanese people has been closely connected with this flower from ancient times; since the Heian Period (794 - 1185), it has often been included in classical Japanese poems. From the early years of the Showa Period (1926 - 1989) till the Second World War, the way that the cherry blossom quickly and gracefully falls was appropriated into militarism to beautify the deaths of the suicide units. Today, Japan has sent cherry trees with their beauty overseas as a symbol of peace, and their light pink flowers bloom every spring, for example, beside the Potomac River in Washington DC, and on the remains of the Berlin Wall. In Japan, people enjoy outdoor parties under the cherry blossoms in early April. They sit on mats under the cherry trees, eating, drinking, singing cheerfully and viewing the blossoms. 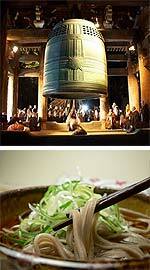 It is held as a ritual ceremony in the Asakusa Shrine in the middle of May. Festivals of Edo (present-day Tokyo) are mainly designed for scores of people to carry portable shrines on their shoulders and parade around an area. The Sanja Festival is popular, with dozens of the portable shrines from each block association and three big portable shrines energetically being paraded through the old traditional streets of Asakusa, There is much music and ancient dances in the precincts of the shrine too. The three days of this festival, together with the first temple or shrine visit of the New Year, is the time when this part of town is most enlivened. Kanda is very popular as the centre of a commercial and residential district of Edo (present-day Tokyo). Those born in Kanda are said to be typical Edoites (Edokko). The Kanda Festival is a ritual ceremony that is held at the Kanda Shrine in May. Like other festivals in Tokyo, the procession of the portable shrines is the main event. The Kanda Festival is high-spirited and has even been called the essence of Edo. Today, it is not as bustling as it used to be, but it is still one of Tokyo’s three major festivals. The bird that represents Japan is the pheasant. Native to Japan, the pheasant has been a familiar sight to the people since ancient times and was designated as the country's national bird in 1947. It lives in wooded areas and grassy fields away from human habitation. Its main features include light brown feathers with black spots for males; females are smaller and have shorter tails than males. In fall and winter, pheasants were objects of hunting. Since ancient times, they were highly valued for eating. They were often used as congratulatory gifts for weddings. Among birds, pheasants are considered the finest species; because of the sorrowful cries of males and females for each other, they are taken as symbols in classical Japanese poems and Haiku (poems in seventeen syllables) of love for one's family. Daruma are dolls without hands and feet. They represent the sitting meditation (Zazen) posture of Bodhidharma, founder of the Zen sect, who was born in southern India but moved to China. Bodhidharma's legs were said to be paralyzed because he meditated continuously on a rock for nine years with his legs crossed, which made him unable to walk. Most daruma are made of paper and painted red, except for their faces. Their bottoms are heavy and work as tumblers. Because they bounce back to their original position when pushed over, they serve as good luck charms. There is a custom of drawing in eyes, which are usually white, when a wish has been fulfilled. 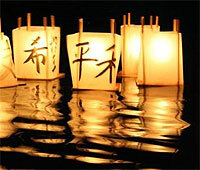 This is a Buddhist event which calls for a memorial service for the spirits of ancestors. It happens from 13th to 15th August. As the spirits of the dead are said to return to this world at this time, fires are lit at the entrances to homes so the spirits will not lose their way. In addition to lanterns being lit inside homes, Buddhist home altars are tidied up and vegetables and fruit are laid out as offerings. When the Bon Festival is over, the spirits are sent on their way. This is called the escorting of the spirits, where fires to send them on their way are lit at entrances of homes and offerings float on rivers and oceans. The third Monday of September is Keiro-no-hi (Respect-for-the-Aged Day), a national holiday. It is a day to honour the aged, celebrate their long lives, pray for their good health, and deepen understanding on the issues of welfare for senior citizens. On this day, regional governments and Respect-for-the Aged associations organize all kinds of events, such as variety shows, as well as donate mementos. Volunteers make visits to old people's homes. As Japan has the world's longest life expectancy, this national holiday is likely to become increasingly more important. In Japan, cats are regarded as auspicious and, at the same time, fierce. The way they clean their faces looks as if they are inviting good luck, so cats with that gesture are represented by an auspicious ornament called the 'beckoning cat’ (maneki-neko). On the other hand, there was a time when cats were thought to be able to transform into monsters. Among the many Japanese monsters is the 'monster cat’. Today, with pet ownership booming, Japanese keep cats from all over the world, but traditionally valued is the tortoiseshell tom cat (mike-neko). Omamori (talismans) are said to summon good fortune and expel evil, so prayers and names of temples, shrines or divinities are written on pieces of wood or paper. They are usually sold at Shinto shrines and Buddhist temples. Prayer requests are varied, such as for traffic safety, passing a school's entrance examination, business prosperity, good health and easy childbirth. One can keep omamori with oneself all the time, be it hung in cars, placed at home or attached to pillars or gates. It is very common in Japan to present omamori to family members or friends who are leaving for travel or doing dangerous work , and also to pray for their safety and health. The last day of the year, December 31st, is called Omisoka. To welcome the New Year with good feelings, a general house cleaning is done. The flooring rush mats (tatami) are re-covered and the sliding paper screens (shoji) are re-papered, family reunions are held and the whole family ushers in the New Year with a sense of togetherness. At about midnight, bells speeding the passing of the old year (joya-no-kane) begin ringing at temples all around the country. According to Buddhist teachings, human beings have 108 worldly desires which are removed by striking the bell symbolizing the passing of the old year 108 times. While listening to the sound of the bells, people eat year-crossing soba (toshikoshi-soba) which became widespread in the Edo Period (1603-1867) in the hope of a long life because soba is fine and long.